Casting its long golden rays through the dia­phanous mist hanging over the tranquil emerald green water of the Mekong River, the sun slowly began to rise on the eastern horizon drenched in a red orange glow, as it anointed Siva on top of Lingaparvata with warm golden hues. What was about to happen next is part dream, part myth and very much a part of real life. The sequence of events at the time of their occurrence would not fully reveal their hidden meanings to me for several months. How those deeper meanings would eventually surface into awareness is what this story is all about. Embarking on any pilgrimage to a sacred site is going to provide the mind with a whole new set of meanings and interpretations. Some of those meanings may be quite obvious and others may have a profound effect on your way of thinking which you may be unprepared to understand. So, there is little one can do in preparing for a sacred journey other than finally committing oneself to going on one. This is a story of a pilgrimage to Vat Phu in S. Laos. A day came and I committed myself to making a pilgrimage. Little did I know I would end up at Mt. Kailasa in the Himalayas with Lord Shiva…well almost. It was early morning and King Devanika, (celestial protection), who came from the Cham holy city of My-Son, was assembling his people to continue their westward journey in search of a sacred mountain which an old rishi named Vaktrashiva told him rose into the heavens and was topped with a crown of gold. The time was about 400AD and King Devanika had been traveling for many days. He had to leave his religious capital of My-Son, near the South China Sea, because warring tribes from the north had weakened and destroyed much of his beloved kingdom. The King brought his architect, King Kammatha, advisors and all his people to find the sacred mountain the old rishi had told him about. The truth of the exact origins of King Devanika may never be known, but what we do know is that he erected a stone stele which was found at Vat Luong Kau on the western banks of the Mekong River and at the base of the sacred mountain which he was looking for. The Lingaparvata (mountain of the linga) was consecrated and a Mahatirtha (very holy place of pilgrimage) was established at its base and named New Kuruksetra (holy land) in honor of the legendary battle fought by Krishna and Arjuna as told in the great Hindu epic the Mahabharata. At this point in my story I am indebted to Chhom Kunthea who is a Khmer scholar from the Royal University of Phnom Penh, Cambodia. Kunthea's recent research on the 64 lines of Sanskrit inscriptions on the Devanika stele bring to life more fully the scope and detail of the significance of the holy land of New Kuruksetra. Kunthea compares New Kuruksetra at Vat Phu with the original Kuruksetra in India and focuses on the meaning and background of the Mahatirtha. With the additional research done by Claude Jacques, an epigraphist from France, Kunthea has been able to show that the knowledge and understanding of the Mahabharata was fully understood by King Devanika and his court. Kunthea clearly shows that the influence of the arrival of Indian cosmology to Kambuja was much earlier than is generally accepted by Indo-Cambodian historians. Certainly it is safe to say that the epic story of the Mahabharata was known very well hundreds of years prior to King Devanikas consecrating his New Kuruksetra at the base of the Lingaparvata and erecting his stele. We might even infer that the rishi Vakrashiva was the Indian poet guru who helped the new king to establish his Mahatirtha where he did. Vakrashiva was known to have lived in the area as a result of Sanskrit inscriptions found in a cave stating it was his home. Vat Phu was the first Khmer temple that shows a direct influence of the Mahabharata on the establishment of the holy foundation that would influence all the future Kings of the empire. According to Kunthea the next time Kuruksetra is mentioned in a temple is 7 centuries later when King Suyavarman II created the southwest bas relief at Angkor Wat. Suyavarman's temple additions at Vat Phu and the construction of Angkor Wat, incorporating Kuruksetra, is testimony to the lasting influence Kuruksetra had on the Khmer Kings. and one would become free from all suffering. To demonstrate even further how the influence of the epic poems of the Mahabharata and Ramayana were honored at Vat Phu one need only visit the UNESCO Project holdings of found sculptures in and around the Vat Phu complex. Through the assistance of Tha Sirychantho, chief administrator for Vat Phu, I was able to see this most amazing collection of lingams, ante-fixes, an un-deciphered stele, and a pedestal for Nandin the bull, also found at Vat Luong Kau, showing a Sanskrit inscription. The inscription has been deciphered by Claude Jacques in an unpublished paper titled: "Mahendravarman's Campaigns in North-East Thailand". But, by far the most exquisite of the stored sculptures is the one showing Hanuman, the Monkey God King, saving Sita from the evil King Ravana. This un-displayed piece of Khmer art shows the beauty of Sita with her long flowing dress as she is whisked away in flight from the evil king. The story of Shiva and Sita is one of the most emotionally moving stories in the Ramayana and the sculpted image was and placed somewhere in Vat Phu honoring the rescue of Sita. The new capital was named Shresthapura. The birth of the Khmer empire began in the middle of the 5th century in Kuruksetra, or what is today known as Champassak, in honor of the Cham King Devanika, The temple of Vat Phu would house the sacred linga of Shiva under the vocable of Bhadresvara, patron saint of the Chams, and act as the spiritual focal point for a long line of Khmer Kings who would develop the Khmer empire all the way through to the 14th century. The implications of the significance for this lasting duration of Vat Phu as a spiritual center can not be underestimated for its influence and meaning when applied to the Khmer civilization. Vat Phu was in all respects a temple modeling the universe and the beliefs which were held secret by the future purohitas and hotars had a lot to do with the way the civilization evolved. Shiva had shown to the world that he was in fact the most respected of all the manifestations of Vishnu. Mt. Kailasa is a very sacred mountain in the Himalayas and mythologically considered to be the sacred abode of Shiva and his wife Paravati. Mt. Phu Kao (chignon mountain) is another very sacred mountain and is located in S. Laos in Champassak, and even though it is not in the Himalayas it is also considered to be the holy abode of Lord Shiva and known today as Lingaparvata. (mountain of the linga). The Kings who came upon the Lingaparvata in S. Laos surely must of thought they were being communicated to by these heavenly hosts of creation when high atop the mountain was fashioned by nature's creative forces a natural chignon, a symbol of Lord Shiva, and below his heavenly abode ran a river reflecting all the stars of the Milky Way galaxy. The entire land was filled with the auspiciousness of Shiva. From the top of the mountain Shiva was holding the mighty Ganges River in his hair, and slowly he allowed it to trickle to earth so prosperity and well being could be enjoyed by all living things. No other place could be more holy than here in S. Laos except for Mt. Kailasa in the Himalayas. While I stood still on the edge of an old motorized raft laden with food and animals to be taken to local markets I saw the western banks of the Mekong River slowly come into focus. As I approached the land I could see thatched houses lining the streets and high in the sky was the silhouette of the Lingaparvata peaking through the morning haze. I knew at that moment I was about to relive one of the most important periods of SE Asian history as King Devanika had done over 1,500 years ago by establishing a holy land that would eventually become the birth place of the Khmer empire. The holy land of Kuruksetra was about to be entered. Once I set foot on the land of this ancient city I could not help notice how quiet every thing was. The cattle were grazing on the open roads and the mood was extremely peaceful. It felt as though time had intentionally forgotten the small town of Champassak, and a distinctive air of a long gone center of religious activity could still be felt. The evening approached and with it a warm dark velvet sky punctuated with a million sparkling stars. I had made it to the holy land of Kuruksetra. Curiously, and unbeknownst to me, I would have a dream that evening which would leave a profound message in my mind, but one I was unprepared to understand until several months later. As I was sleeping the dream came unannounced and from high in the night sky a tumbling cube came falling to earth. The cube became larger and larger until it seemed I was at the center of the cube. I was surrounded by white walls and noticed a door opening, and in walked what appeared to be people all dressed in long white robes. They talked to me and told me I was a two dimensional person and that they were multidimensional. They presented a small book for me to read but said everything in it was a secret. They then showed me a person being put into a golden colored box which seemed to contain a yellow liquid of some sort. When I looked into the box I saw things flying all around in a whirl pool of energy. I asked if I could go outside of the room. They said I could but if I did the things I saw and read would not be known anymore. Only in this small room along with the golden liquid cube was I able to listen to everything they said. I can not recall all they told me. The dream was extremely clear as if I were actually in such a room. I was awakened by a ringing sound and realized it was the sound of a Buddhist bell permeating the early morning solitude of Champassak. The bell was on Vat Thong's temple grounds which I passed upon first entering the holy land of Kuruksetra. As I walked down the dirt road to visit Vat Thong that morning images of the tumbling cube were still in my mind. What I saw at Vat Thong was the most beautifully decorated golden bell tower over looking Phu Kao Mountain. It did not take much hesitation on my part to climb the steep inclined stair case that reached to the top of the bell tower. With my camera slung over my shoulder I was hoping to capture a better view of the Lingaparvata. Once on top I had the most beautiful view of the surrounding holy land of Kuruksetra. Totally entranced with the view and walking in a circle around the top of the bell tower a most unfortunate accident took place. A dull gong like sound entered the air which was immediately followed by a sharp pain to my forehead, accompanied by warm red blood flowing down my face. I was stunned and my head was throbbing, dizziness set in and everything started spinning underneath me. In an instant serenity was turned into fear thinking that a sever cut to my head might require stitches. I had walked directly into the bell making everything start to turn and spin before my eyes as I descended the staircase which seemed extremely wobbly and very steep. Water was my first priority which I saw coming out of a hose next to a stupa on the temple grounds. Numb and bewildered the water felt cool and rejuvenating. Was this the end of my pilgrimage or an initiation to enter this most sacred ground? Was it necessary to spill blood before Vat Phu became a reality for me to explore? I had journeyed to far to stop now and kept my determination and resolve to continue with my pilgrimage. I suppose a dream of a cube coming from space with white robed people talking to me and showing me a golden liquid whirlpool in another cube, followed by walking into a bell at Vat Tong could be looked upon as just a series of unconnected events and no more. Somehow I thought differently about these unusual events. I certainly felt very different from when I first got out of bed that morning. I met my guide Bountham Penkham back at the Vong Paseud guest house and we immediately left for Vat Phu. The entrance to Vat Phu was about 10KM from the guest house. It was extremely hot and dry. The landscape appeared as if you entered an alien world and the world you left behind the never existed. Pockets of mud and algae made the landscape appear alien and surreal. The entire countryside looked as if nobody ever came here with the exception of the villagers who erected their thatched homes. I realized I was in a very ancient land which had been the cradle of the Khmer civilization. I looked for as many indications of this former empire as I could based on what knowledge I had accumulated since November of 2003 when I was in Vientiane, Laos. From that time until now, April 2, 2005, pilgrimages were made to Preah Vihear and Beng Mealea in Cambodia. Everything I read of the Khmers always referred back to Vat Phu. Then out of the corner of my eye I noticed a sandstone pedestal which was used for a statue and was lying half buried in the ground. It was my first architectural sighting on the Kuruksetra plains. Further ahead of the pedestal was a small shrine in total ruins pointing directly at the Lingaparvata and sitting solemnly underneath a large tree. Upon closer inspection it may have been a Neak Ta mound holding ancestral spirits. The condition of the shrine made it hard to determine exactly what was there, but it was a certainty that an effort had recently been made to provide some sort of protection from the weather. The use of the mound had long since been abandoned as was evidenced by the collapsed enclosure under the tree. However, to my amazement, when I returned to Vat Phu 6 months later a completely new enclosure had built around this sacred spot. I was happy to see that since my first visit to this shrine, when it was in shambles, was now restored and the spirits were still being honored. I could not help but feel that my first visit had re-awakened the spirits that were already at the mound and their powers were now felt by the villagers encouraging them to once again honor the spirits with a proper shrine. Surely the shrine was an active site for many hundreds of years, and it was a visible confirmation that far from the main sanctuary of Vat Phu a shrine was placed on the Kuruksetra plains to continually pay respect to Shiva on top of Lingaparvata. At this point I had no idea what to expect next as we continued on to Vat Phu. Near the entrance we were greeted by Thongkhoune Boriboune, the current Director of Vat Phu. I had been introduced by letter to Thongkhoune Boriboune by Thongsa Sayavongkhamdy, Director of the Department of Museums and Archaeology Ministry of Information and Culture, in Vientiane. Thongsa was the person responsible for getting Vat Phu to be put on the list of World Heritage Sites in 2003. Through meeting Thongsa, in Nov. 2003, was I then recommended to Thongkhoune to support me on my quest to understand Vat Phu. 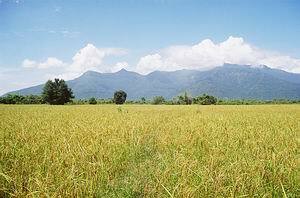 Once Bountham, my guide, arrived at the eastern most baray the atmosphere all around the base of the mountain was perfectly quiet. Frozen in time is an expression that comes to mind to describe what I was feeling. Very far ahead were the outlines of a temple, but from where I was standing only water lily's were reflecting the morning sun. The approach to Vat Phu is solemn and dignified with a grand walkway lined with lotus carved columns exuding a different sense of time the closer you approach the main palace. It was so supremely quiet that it was as if an entirely different space had been entered. Somehow I felt I had passed into another dimension of time and could not help remember standing in the cube in my dream the night before. The cattle were grazing on the plains as they had for centuries completely oblivious to the strangers where were walking directly in front of them. Truly nothing had changed over the centuries. When King Devanika saw this land over 1,500 years ago he too had to have been struck by the natural symmetry that lay stretched out before him. From the top of the Lingaparvata to the river of stars directly behind him he had to have thought he was in a magical kingdom. For over 1500 years this land acted as a spiritual focal point where Lord Shiva lived with his wife Parvarti. Two ancient trees formed a natural gate into the palace grounds. On the north side of the causeway the northern palace stood majestically still and stately as if still occupied by kings studying their scriptures. These temple additions to the land come from a long line of Kings who started coming to Vat Phu to receive what can only be considered the most holy of holy instructions to honor the living Shiva, understand his celestial abode and give guidance in governing their Empire. How fitting then that Devanika's name is translated to mean (celestial protection). What is known of the ancient city of Shresthapura is very little. The research done in the early 20th century by scholars such as Louis Finot, Georges Coedes, Henri Parmentier and Etienne Aymonier provide valuable historical perspectives on Vat Phu gained from the inscriptions on the Devanika stele found in the surrounding area. The Devanika stele was found at Vat Luong Kua and translated by Codes and Claude Jacques with further research done by Chhom Kunthea which led to more insights on the historial beginnings at Shresthapura. Charles Higham, from New Zealand, has provided excellent background research of the early civilizations before the Khmer Kings came to the Kuruksetra plains. Finally, the exhaustive work of Lawrence Palmer Briggs pulled all the Khmer research together in a book he published in 1949 titled "The Ancient Khmer Empire". After King Devanika's reign there is epigraphic evidence showing a lineage of successors to the throne, albeit the details on the duration of their individual reigns is hard to identify. Shresthapura would act as a focal point to educate and establish the many ministerial decisions that would last for 400 years before King Jayavarman II established the Khmer Empire in 802AD. Eventually the seat of the Khmer Empire would be re-located to Angkor Wat where King Suyavarman I began the foundation of the most astounding temple mirroring the secrets of the universe. All the Khmer Kings, all the way up to King Suyavarman VIII, would pay tribute to Vat Phu by adding new additions to the temple and supporting the daily functioning of the temple with supplies and food. Unfortunately, the sacking of Angkor Wat, by Siam in 1471 AD, brought a slow abandonment of all temples in the empire as well as the wonton destruction and removal of the most important documents showing the significance of the empires operation. But as in the beginning, Vat Phu made a peaceful transition to become a place for sacred pilgrimages even without the support it had received up until King Suyavarman VIII. As a consequence Vat Phu is the only ancient city that still has intact its foundation walls from the early 5th century prompting it to be registered as a World Heritage Site in 2003, and an untrammeled land from the ravages of war, but not the tempers of Mother Nature which has eroded and felled many of the stone structures. So, passing through the ancient trees onto the temple grounds today can still capture the mood of what it was like 1,500 years ago. And of course the Lingaparvata, sacred mountain springs and the mighty Mekong River are unchanged with time. Hundreds of years would pass before these great temple palaces would be erected. During this time a cosmic union took place which wedded the nature spirits of the Khmers with the ancient beliefs of India that were transmitted by the Brahman priests. This combination of the natural lingam protruding from the top of the mountain combined with the symbolism associated with the Shiva lingam made a most unique divine environment for the development of the Khmer cosmology. This pre-Ankorean center slowly became a training center for ushering in another kingdom devoted to the holy trinity of Brahma, Shiva and Vishnu. In fact the belief that Shiva's presence was actually on the mountain is totally understandable. The centuries before Suyavarman II are lost in history, but the presence of the palaces and sanctuary testifies to the importance this holy land held for the Khmer kings. The decision was made to create a temple devoted to Shiva by creating a long axial approach to the sacred spring on top of the hill from whence the holy waters flowed from Shiva's hair and gave life to all the inhabitants of earth. Two identical and symmetrical palaces sit on the ground one north and one south as if some heavenly secret was trying to be conveyed by this architectural uniqueness. It was built by King Suyavarman II who gained experience and knowledge from building Angkor Wat. He knew how to incorporate the secrets of heaven into Vat Phu's construction. But what were those secrets? What sacred design was the King trying to convey? Are there other symmetries at Vat Phu that might lend a hint for the reason of their construction? The answer to these questions is that there are numerous symmetries at Vat Phu all of which mirror the heavens. These two magnificent quadrangles sit on the ground defying interpretation. We can gain some understanding of those secrets by referring back to ancient Vedic texts where the understanding and significance of the movement of heavenly bodies was a subject of study and expertise known by the ancient Vedic astronomers. If we refer to the scholarly text "Hamlet's Mill" written by Giorgio de Santillana and Hertha von Dechend in 1969 we learn that the quadrangle was another name for the earth. The importance attributed to this concept by the temple builders lends understanding as to why the builders chose these two quadrangles at Vat Phu. An excerpt from Hamlet's Mill (p.253) states that, "Earth" is the implied plane through the four points of the year marked by the equinoxes and solstices, in other words the ecliptic. And this is why this earth is very frequently said to be quadrangular. The four "corners" that is, the zodiacal constellations rising heliacally at both the equinoxes and solstices, parts of the "frame' Skambha, are the points which determine the "earth". The northern palace quadrangle represented the equinoxes and the southern palace represented the solstices. Every world age has its own "earth'. A new "earth" arises, when another set of zodiacal constellations are brought in by the Precession which determines the year points. Skambha is the world axis." This will not be the only astronomical reference used by the builders at Vat Phu. But as I had come to learn the whirl pool of energy I had in my dream was incorporated into the design of the upper most sanctuary along with the world axis known as Skambha mentioned in the hymns of the ancient Atharva Vedic texts. I strongly suspect Vat Phu housed an astronomical library and was a sacred temple for understanding the workings of the heavens. This knowledge was the foundation and spiritual force which was able to launch one of the greatest empires on earth. I will mention the astronomical significance in section 3. I think what you have to do when encountering a new temple is try and imagine what it was like living in and among the temple grounds. If you slowly walk up and down the stately corridors between the massive laterite walls under the imagined pinnacled roof with the rooms and corridors all filled with rare incense then the beginnings of a mood overtakes the senses and you start to get lost in a world long gone from today. Beautiful balustrade windows lined the corridor facing the causeway casting decorative shadows on the long sandstone floor. The windows of both the north and south palaces face the axial causeway that goes all the way to the upper most sanctuary. I entered the palace, however, from the eastern portal next to the false door. High above on the corner was a naga ante-fix staring out onto the grounds warding off any who would come too near. The two tiered triangular pediments form a truss like structure for the roof beams which originally enclosed the great corridors truly giving the impression of a vast temple pointing to the heavens. Directly above the eastern portal was none other than Lord Shiva and his wife Uma riding Nandin the bull in a northerly direction. This was surely Shiva's earthly home. Once inside the palace there is a large quadrangular court yard completely surrounded by a 62m by 42m rectangular corridor complex. I immediately recalled my dream the night before of standing in a cube which was inside a cube, and now here before me were both the outer corridors and the open inner sanctuary of the palace. I remembered that in my dream if I left the inner cube I would forget everything told to me by my celestial teachers. I could only surmise that in the evenings when the stars could be seen in the heavens, framed by the inner walls of the palace quadrangle, would the secrets of Vat Phu be revealed. Surely no roof could have spanned such a large open space. The coincidence of seeing this large open court yard for the first time, and recalling my dream seemed all too familiar to me. It was if I were reliving an experience from a very long time ago. I became very suspect that I had been here before, but of course I knew that was a thought I dared not entertain. However, if this courtyard was similar to the cube within a cube from my dream then where might the symbolism of the swirling vortex inside the liquid orange cube be found? What did the incident with the bell tower that left a large cut in the center of my forehead mean? In the SE corner of the northern palace is a small room and outside of this room, facing east, is a false door and the tympanum above the door shows Shiva and his wife riding Nandin the bull. The ante-fixes are naga heads giving this corner of the palace a very important feeling. Perhaps this was the king's sleeping quarters. Fallen on the floor in the room is a perfectly cut triangular stone acting as the peak stone for one of the two tiered pediments which formed the roof. A small door sits up a few stairs and separates this corner room from the rest of the long east – west gallery. Directly north of the corner room you can cross through another doorway entering the long corridor going due north. Unfortunately parts of this corridor have almost completely collapsed. From this corner room the king could circumambulate all around the quadrangle (universe) before ending back in his room. The same was true for the southern palace. The main entrance to the northern palace is in the center of the long corridor which is aligned east and west and facing the causeway. Extending from these central entrances are two foreparts with porches. Directly across the causeway from the northern palace's central entrance is the entrance to the southern palace. This is a perfect example of the symmetry executed by King Suyavarman's builders. Walking out of the northern palace's median forepart I turned around to see where I had just come from wondering if I would ever see this celestial home again. I happened to glance down at the bottom of the colonettes next to the door frame and there, almost eroded completely away, sat both Shiva and his wife in a very relaxed and endearing pose. I had no doubts this was a tribute to the palace being their home. These figures are not easily spotted because of their eroded condition. But the endearing poses and the expressions on their faces indicates that King Suyavarman I held Lord Shiva and his wife in high esteem. There has been speculation that the northern palace was for men and the southern palace for women. I would offer instead that the northern palace was for the King and his wife and the southern palace was for the priests, guides and other members of the king's court. The southern palace has a completely different feeling from the northern palace. Even though it is perfectly symmetrical with the northern palace it feels very distant and more removed. It is my speculation this is the solstice palace which represents the time of the year when the night is the longest during the winter solstice. The southern court yard seems to exude a more open feeling as if more people gathered here. On the contrary the northern palace courtyard felt private and more sacred. High above the western end of the east-west corridor of the southern palace, with the Lingaparvata in the background, is a perfectly good example of the use of the pyramidal place stones forming the two tiered triangular roof. The corner room at the western end of the NE corner may have been the room where the head priest stayed. The door way at the west end of the southern palace's NW corner that connects with the south corridor has to have two of the most beautiful sand stone carvings still in tact above the lintels. I had to climb to the top of the inner western wall of the southern corridor to position my camera in order to capture these carvings. One feature I found to be most interesting was a spiral carved on the stomach of one of the personages. I believe this is a scribe and his markings signify his knowledge of astronomy and the astronomical significance employed in the construction of Vat Phu. There is also a spiral carved on the Buddha's foot print on the rock faced cliff behind the main sanctuary. These three buildings at the base of the main sanctuary prepared the Kings and devotees for their ascension to the holy Shiva lingam. Climbing up the terraces and staircases were structures on either side reflecting the cosmology of the ancient Hindu astronomers. Interestingly there are 36 lotus columns on each side of this causeway numbering 72 in all. It is this number 72 which is a strong indication on Vat Phu's encoding of astronomical events. The numbers which occur with great frequency in all the world myths are 12, 30, 72 and 360. But the most significant number encoded into the "myth-code", acting like a cipher for understanding all the other numbers, is 72. It is an astronomical fact that it takes 71.6 years (72) for the equinoctial sun to move one degree on the path of the ecliptic. In 2160 years the sun would have moved 30 degrees or one New World Age. After the sun had traveled 360 degrees (360x72) 25,920 years would have passed equaling one complete precessional cycle or a "Great Year". After the "Great Year" the next cycle would begin called the "Great Return". The "Great Return" signifies the return to the golden age when men were gods. This "Great Return" is now taking place in the heavens and our earth is about to fully enter another New World Age called the Aquarian Age in the tropical zodiac. In the sidereal zodiac using the Nakshastras of India Lord Shiva will be nearest this point of the "Great Return" in the year 2012. This is the time when the Nakshastra named Ardra is closest to Vishnunabhi, the eye of Brahma, Moola, or the galactic center during summer solstice of 2012AD. This most significant astronomical event was recognized by the temple builders at Vat Phu and was encoded into the oldest existing structure. The priests aligned the sandstone chapel located next to the sacred spring behind the main sanctuary with the summer solstice. Thus the lotus pathway of 72 lotus columns attuned the spiritual seeker with the frequency necessary for their ultimate journey of becoming immortal gods. Once the pilgrims reached the end of the 72 lotus column lined causeway they began their long aromatic journey beginning with the first stairway leading to the main sanctuary. The stairways are lined with fragrant frangipani trees making the senses become overwhelmed with the scents of the white flowers filling the air. At the top of the 1st stairway I experienced an awakening to a new reality that I had a great deal of difficulty accepting. It was a juxtaposition of images that I could not help be affected by. I immediately recalled the feeling I had at the Angkor Conservatoire in Siem Reap when I encountered the recovered statues of Shiva from Beng Mealea. Now, here before me were two fallen headless human statues lying on the ground with their feet adorned with toe rings affixed to the pedestal where they once stood. Their sampots were facing the sky in all their intricate detail and I could not help but feel that these statues should still be standing. There was something more powerful at Vat Phu that defied that these fallen guardians to the upper sanctuary should be where they were. I wanted to lift them back up and bring their nobility back to them as it once was. The reality of how ancient and how neglected these mighty guardians had been treated left me with a very disconcerting feeling. These were the temple guardians watching over those who passed by to journey up to the next level before the upper sanctuary would be reached. Surely it would never have been considered that a time would come when these powerful guardians would no longer stand firm before the world. Miraculously one guardian is still standing from the 9th century and is referred to as King Kammatha, the great temple builder from Champa, who accompanied King Devanika on his quest for a new kingdom and built the first temple at Vat Phu. The final approach to the main sanctuary on the upper most terrace at Vat Phu is reached by a very steep set of stairs comprised of 7 sets of eleven stairs each. Symbolically these stairs refer to passing through the 7 lokas (worlds) to reach final enlightenment. To reach the abode of the gods in heaven, filled with stars (nakshatras), the spiritual seeker must pass through these 7 worlds. It is the ascent through the Lokas that man leaves the earthly realm and climbs to the highest realm of the gods. Upon reaching the edge of the terrace I saw before me the side of the mountain coming down to meet the most exquisite temple which seemed to be untouched by time. The sunlight was being cast down into the center of the temple only to come forth from the main entrance with a shimmering golden orange glow. I could not have been more transfixed as I was at that moment upon first seeing the sanctuary. There before me was the orange cube I had seen the night before in my dream. There was no doubt in my mind that this was the very image I had in my dream. I knew then that my dream was a premonition of what I was about to experience on my pilgrimage to Vat Phu. As I approached the golden glow shining out of the sanctuary the one thought occupying my mind was if the whirlpool of energy was inside the sanctuary and if the cut on my forehead had any significance. At this point I felt as if I was half awake and half in a dream. The coincidence to witness this golden image made me realize I had already been here. Somehow everything I was seeing was in some way connected and if I could only put all the pieces together I would know what was told to me the night before by those visitors inside the cube. If I had doubts earlier, when I was in the quadrangle of the northern palace concerning whether I had been here before, those thoughts had all vanished and I was now entertaining the idea that maybe I was here before. Standing directly in front of me, as if frozen in time, were the two most remarkable figures I had ever seen. Nothing what so ever indicated they could not come to life as the details of their personages were so very perfect in their artistic execution. These two beautiful apsaras (celestial nymphs) were adorned profusely with jewelry and the finest of silks. I spent a long time admiring their countenance as if in some way they had something to say. A closer look reveals the details of both the way their hair is styled and the jewelry which accents their presence. Their smiles are still alluring and they still exude a grace and sensitivity which I find most exceptional after all these centuries. 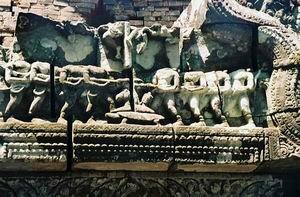 As I continued to study these Apsaras I became intrigued with the apsara on the north side of the central shrine. Specifically I was curious over how a knot had been designed into her long flowing hair. At first glance I paid little attention to this aspect of a knot in the hair but then I noticed how gracefully she was holding the hair in her hand. Her hair was very long ending in the shape of a chord or rope. At this point I realized that carved into the stones of this central shrine there were probably many design elements which concerned themselves with messages about ritual practices the priests would perform for the kings. These messages could also be easily overlooked as they were incorporated very subtly into the overall design of the sanctuary. I moved closer to the Apsara so I could photograph her hair knot. I was intrigued and drawn to this knot even though I had no idea why. Months would pass before I would finally be able to interpret a divine message not only with this design element of a knot, but with many other motifs incorporated into the Vat Phu complex. 1. "Speech is his (the breath's) rope, the names the knots. and with speech he calls everything." There are eight Khandas (verses) in the Aitrareya Aranyaka describing how Brahma brought life into this earthly realm through his breath, and the austerities that must be performed and the lessons to be learned by us humans to re-enter the immortal realms of the gods. If my recognition of this knot truly is a sacred message, as I suspect it is, I can well imagine what purpose this shrine provided for establishing the spiritual ground work for this astounding empire that lasted nearly 1,000 years. After seeing how the knot was used as a sacred message I then looked upon the Apsara on the southern side of the central shrine with an entirely new perspective to again see another story carved in stone. The celestial nymph facing south had the most unusual coffered hair style, as well as having unusually full breasts. In her right hand she is holding a lotus blossom while her left hand is facing downward to the earth. I then realized the hair ornamentations were symbolically representative of the lotus flower. I come to learn from the well known Indologist, Heinrich Zimmer (1890-1943), that this figure is the goddess Lotus-Shri-Lakshmi. The use of lotus flowers in her hair, as well as her large breasts signifying having abundant milk to give life to the universe, were the two elements that enabled me to see this celestial nymph in a much different light. The long lotus stalk passing up through her right hand is known as "lotus in hand" (padmahasta, padmapani) while the right hand faces downward bestowing gifts. This is none other than the Great Mother Goddess of the ancient civilizations and is referred to in the Rig Veda as prajanam bhavasi mata, "Thou art the mother of created beings". Now, I realized that represented here, at the main sanctuary, was Lakshmi the consort to Vishnu. The use of this symbolism at Vat Phu is to show that this temple was the gate to the universe for the lotus is the first product of the creative principle and the Lotus-Shri-Lakshmi is personified as the Goddess Mother of the created world. I did not enter the eastern entrance to the sanctuary which was between the two Drarapalas, Apsara and Great Mother Goddess, but instead went around to the southern entrance. It was here at the southern entrance into the sanctuary that the orange cube began to spin in my mind. Immediately I found myself entranced with what I knew to be the whirl pool to the center of the universe. There on top of the door way was the lintel with Vasuki the serpent king, the asuras and devas, Kurma (avatar of Lord Vishnu) the tortoise, and the head of a horse. The churning was taking place at the sanctuary, the milky ocean was being churned and the elixir of immortality was being sought after. This was the time when a new world age was about to take place and the gods were summoned to stabilize the universe. As time and the heavens move endlessly in Indra's home of the universe there are apparently few people on earth today who realize that a large celestial occurrence is taking place between our solar system and the Milky Way galaxy. The ancient cultures were well aware of these celestial movements and discussed them for thousands of years until those stories of the secrets of the heavens became abandoned and neglected. Few today would consider that the center of our Milky Way galaxy could transform the way humans thought about themselves in the universe. Celestial mechanics is not something taught in any grade school and only in those universities that would be offering and an astronomy course. But even if celestial mechanics were being taught any eschatological or cosmological significance which could be attributed to these heavenly movements would be non-existent. So where could one find the teachings of the spiritual dimensions to the workings of celestial mechanics in our galaxy? I doubt anywhere, but even if it did exist it would probably be buried in some remote academic department and could never be found. The question needing to be answered is what does the spiritual significance mean to anyone when they associated that spirit with astronomical measurements of moving bodies in space? The symbolism the astronomers from India were using long ago originated from ancient stories which became myths, but those myths carried within them the nature of humankind's exalted place in the universe. The churning of the milky ocean is one of those exalted myths that if understood would allowed humans to travel freely in the universe, and if those humans knew how to read the stars that moved in the heavens they could also achieve immortality. Vat Phu was a temple to the stars and Kings and priest traveled to Vat Phu for over 1,500 years to learn of those secrets to assure their immortality. 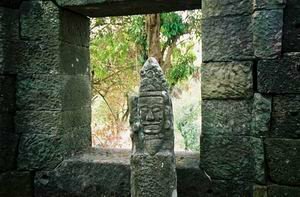 It was from Vat Phu that the Devaraja cult was born where man and god were fused together and the divine relationship between the Kings and Gods would be preserved. During the latter part of the 20th century there were two humans who were able to unlock the secret of how the ancient cultures understood their relationship to the stars, planets, galaxy and the larger universe. I suppose we could call these people "mythical-code breakers". If it were not for Giorgio de Santillana from the history of science department at the Massachusetts Institute of Technology in Cambridge, Massachusetts and Hertha von Dechend from the Frobenius-Institut in Frankfurt Germany the world may still be in the dark concerning the history of the ancient cultures going back over some 10,000 years or more. Their contribution was in deciphering all the world myths and how they related to astronomical events in our local galaxy. The myth that was persistently integrated into all the world myths was about an axis or pole or even a pillar that became unhinged or broke thus leading to a frantic quest to save the earth from falling into the abyss. The story most used in all these myths to describe the fall of man and the world was about a mill. The frantic quest to save the mill from not working or not being able to turn or churn became the myth of the Churning of the Milky Ocean. Their book, "Hamlet's Mill", published in 1969, was the beginning of modern man understanding the beliefs of ancient man. This myth is prominently placed on the southern entrance to Vat Phu. King Suyavarman I and his purohita, Sivacarya, made certain that this myth was integrated into the temple design to preserve the ancient history of the human race and how men were once Gods. In the Vedic literature of the Rig Veda there are spiritual and philosophical hymns dedicated to this mill pole. Hymn (10.7) of 44 verses in the Atharva Veda is titled Skambha (pillar) "The Support of the Universe". It is dedicated to the eternal entity or Brahman which existed before the manifested universe. Everything is established from this pillar (Skambha). Again, on top of Vat Phu the Skambha is shown on a scene from the churning of the milky ocean on a lintel above the southern entrance to the main sanctuary. As humanity enters the beginning years of the 21st century hardly any attention is being devoted to the most significant celestial occurrence taking place currently in our solar system. The ancient cultures, however, were well aware of the significance of the precession of the equinoxes and integrated it into their cultures as a creation myth. The myth had existed for thousands of years but then became forgotten and abandon as having no relevance to human evolution or personal growth. But then, Joseph Campbell, a world renowned mythologian, resurrected myth from fantasy and falsehood in the last part of the 20th century and showed to the world how celestial events do hold great spiritual and psychological meaning for personal human growth. These celestial events have been, for the most part, relegated to the concept of myth or just stories completely invented by human imagination without any influences from celestial bodies. Campbell demonstrated that myths were metaphors for humankind's spiritual and psychological transformation and that the heavens were filled with a multitude of spiritual influences. Near the close of the 20th century the code to understanding these ancient myths had finally been understood. As a consequence of these deeper insights into the ancient past a flurry of scholars worldwide recognized the wisdom revealed by Giorgio de Santillana and Hertha von Dechend and began publishing works related to the ancient myths. The following is a short list of publications which have provided the world with new understandings of the relationship between myth and astronomy. Not only had contemporary authors seen the significance to the "myth-code" being deciphered but ancient texts and ancient monuments were now seen in a totally new perspective by recognizing how these astronomical events were incorporated into architecture and a few surviving epic tales. Everywhere new insights and revelations were being discovered as well as new ancient temples being unearthed. In the dense jungles of Johor, Malaysia the 7th century lost city of Kota Gelanggi has been located by Raimy Che-Ross claiming it may be the capital of the Sri Vijaya Malay Empire. And it the northwest Peten region of Guatamala the lost ancient royal center called La Corona was finally found by Ian Graham of Harvard's Peabody Museum. All these discoveries are pointing to the quest of a common myth which shows the spiritual significance these ancient cultures attributed to the precession of the equinoxes and their alignment to heavenly bodies. Oliver L. Reiser, (1975) told the world how our galaxy has a profound influence on our lives. These were not just simple astrological musings but carefully researched insights which gave Reiser the wisdom that it's the heavens that make us become what we are as a result of celestial cycles and cosmic influences. Few today, however, would consider the influences the center of our Milky Way galaxy has on transforming the human psyche. Lingaparvata thus honoring and preserving the World Age in which the Khmer Kings would rule for over 1,500 years. The glory of the universe was understood by those Brahman priests, and they left behind a legacy in stone so that the amnesia that besets our current civilization can end and a new world age of attunement to the heavens for our much heralded global humanity can be achieved. So now Vat Phu takes on an even deeper meaning. Not only is Vat Phu the cradle of the Khmer empire, but it is also the center of deep spiritual awareness of humanity's place in the universe. Let us begin our journey into that whirl pool of orange light and see the wonders of heaven open up before us. The whirl pool was spinning and I could hear voices as I did in my dream. Somehow I knew what was told to me by those visitors that came through the door of that cube in my dream. They were the celestial teachers telling me the story of the creation of the universe. It was clear now they were Bhrama, Shiva, Vishnu and Sakti the four principle Hindu deities which Chhom Kuthea claims reside in Kuruksetra. I wondered how much of my dream I could recall. Inside the sacred orange cube, from my dream, the lord of the Gods (Indra) watches over the eternal celestial cycles as he rides his great three headed white elephant Airavata. Indra is placed on two lintels in the center of the main sanctuary facing east. Once you pass through this star gate you enter the most holy of holy sanctuaries; the home of Lord Shiva. All the legends of the creation of the universe are here remembered and it's from this one central place in the temple where the kings would be closest to the gods. But what else does the main sanctuary provide these Khmer kings? After all, Suyavarman I was considered to be the greatest temple builder in the entire empire. I have made reference earlier to the quest for immortality as it was told in the ancient literature from India. The southern entrance has several carvings which indicate that to obtain immortality an understanding of the abode of the gods was essential. In fact a manifestation of Shiva as an ascetic in deep meditation can be found on the lower most corner of a colonette holding up the lintel showing the churning of the milky ocean scene. To enter this sanctuary only the most enlightened pilgrim would be allowed to enter. The first lintel above the colonette is the most instructive to this celestial knowledge. However, unlike the churning of the milky ocean scene at Angkor Wat, Vat Phu's is much smaller. What is so unique about this churning scene is the depiction of the head of a horse and the head of Vishnu on top of the back of Kurma; lord of the tortoises. Kurma is also another manifestation of Vishnu. As the epic tale is told in the Mahabharata Kurma used his tortoise shell to support Mt. Mandhara which in turn was used as the churning pole to stabilize the world. Vasuki, King of the serpents, used his long body to wrap around the mountain while the Devatas pulled on the tail and the Asuras pulled on the head. Vishnu stabilized the churning pole high atop the lintel with only his lower legs now showing. These two celestial beings pulled back and forth churning the ocean of milk for a thousand years to bring forth the elixir of immortality. Directly beneath this scene is the most amazing face of Kirttimukha (divine guardian) supporting the entire churning effort. The Kirttimukha is a special representation of Shiva himself. If anyone neglected to worship this face they would not receive Shiva's grace. However,, if the devotee greets Kirttimukha as Shiva himself as both a sign of his destructive powers and divine grace then Shiva will allow the seeker to receive the secret knowledge. Between the churning of the milky ocean and Kirttimukha is a hint to the astronomical awareness inserted at this lintel before entering the holy sanctuary. Interpreting the meaning of these small orbs around the lintel opens the seeker into the depths and secrets of the universe. Counting these small orbs one can discover that there are exactly 108 in each circuit. It is well known that the number 108 is the most sacred of all numbers in Hindu cosmology. There are many ways 108 can be interpreted for a deeper understanding of the cosmos. In the Sanskrit alphabet there are 54 letters. Each letter has a masculine and feminine aspect representing Shiva and Sakti. There are 12 constellations, and 9 arc segments called namshas or chandrakalas equaling 108. The diameter of the sun is 108 times the diameter of the earth and when 108 is incorporated into Hindu sacred literature we find that there are 108 Upanishads. These are all abstract symbols mirroring the myth of the ancient stories of the origins of the universe. So by having this lintel between the churning of the milky ocean and Kirttimukha indicates that there was a secret that was well guarded at Vat Phu which only the initiated could know about and learn how to use for the ultimate quest for immortality. In the Rig Veda Samhita there is a passage which refers to the Ashvin Twins being replaced with the head of a horse. This verse refers to a girdle around the waist similarly to the one shown on the lintel behind the churning scene. To paraphrase the verse it reads…"the horse's head becomes the revealer of the secret knowledge of the elixir which acts like a girdle, *(around the waist), to strengthen the understanding of the spiritual obligations necessary for Shiva. In the Nakshastras Shiva is represented as Ardra the god of destruction. When Shiva comes close to the galactic center in 2012 the destruction of the world will take place. It is at this time when that which has been made manifest will be destroyed in order to save grace for the future. This is the time of the dark night of the soul in preparation for a new dawn or a new beginning. If we look at the next Nakshastra it is Punarvasa or the "return of the light". The presiding deity is Aditi, the mother of the gods, and the reigning stars are Castor and Pollux the Gemini twins, the two who give back the good. Another set of twins which can be woven into spiritual form and a reminder of the operation of the heavens at Vat Phu. After the "myth-code" was finally deciphered by Giorgio de Santilana and Hertha von Dechend in 1969, much like the Rosetta Stone which was deciphered by the French scholar Jean François Champollion in 1822 unlocking the mystery of Egyptian hieroglyphs, the churning of the milky ocean could then be read as a specific astronomical event. That event was the precession of the equinoxes. In 400 BC the sun would rise during the spring solstice in the asterism (constellation) of the Horse's Head indicated by the Nakshastra (Hindu star positions) of the Ashwin Twins. This celestial event is where the sun is near the intersection of the Milky Way and the ecliptic. These Ashwin Twins announced the day, and from the center of the Horse's Head brow a bright flame came forth cleansing the world. After I became aware of the horse's head story in the Mahabharata the cut of my forehead took on a new significance. Again, it's necessary to go into the Mahabharata and read the story of how Vishnu put on the horse's head with a flame coming out of his forehead to reclaim the elixir of immortality to fully appreciate the symbolism. It became an overwhelming personal revelation to now be able to integrate all the elements of my dream which happened the night before with the events unfolding as my journey to the main sanctuary was becoming more understood. It would take five months, however, of questioning and research to finally understand the significance of what the lintels could mean to the Khmer kings and priests. After the milky ocean scene the last lintel before entering the main part of the sanctuary was a most curious depiction of a scene from the Vedic literature. Two identical beings were emerging from the womb of another deity. I could not help but see this scene as the Ashwin twins themselves. The epic tale of the Head of the Horse in the Mahabharata is much to extensive to include in this writing. However, Ucchaishravaa, the gem among horses did emerge from the milky ocean. For out of the churning of the milky ocean many things emerged before the elixir of immortality finally came forth as is written in the Puranas. The Ashwin Twins cleared the path of any debris that would hinder the journey through the stars and beyond through the gates of heaven or the sun door as A. K. Coomaraswamy refers to them. Passing under the Ashwins the seeker of the secret knowledge would then be in the center of the sanctuary and joined with the gods. The devas and the asuras churn the sea of milk (the Milky Way Galaxy) back and forth. They are trying to stabilize the Skambha (the world pillar) as the slow movement of the equinoxes begins to shift and the Skambha no longer points in the same direction. The whirl pool inside the orange cube is filled with many elements which all refer to stars in the heavens. And the apsaras it is said, over six hundred million, came from the churning dazzling everyone who saw them. The firmament became a chandelier of lights and the great sea of stars stretched across the sky. And behold the brightest star of all the jewels in the universe, called the Kaustubha, came forth from the churning and became the center gem on Shiva's breast plate and the center of the galaxy itself. When the elixir finally appeared from the churning of the milky ocean the one who held the secret to the stars could then pass through the gates of heaven and drink of immortality. These gates were guarded by Drarapalas and lions facing the east where the Ashwin Twins, being the leaders of all the nakshastras, would rise in the morning clearing the way to the gates of heaven, the sun door, where millions of dazzling lights (Apsaras) filled the heavens and the quest for immortality was attained. It is no surprise then that the large court yards were built the way they were. The axial path way to the stars was the ultimate design of Vat Phu, and once the center of the main sanctuary was reached all the knowledge acquired from each station on the way to Shiva's abode prepared the soul to enter the eternal life of the gods. I do not see this design at Vat Phu in any other way. Vat Phu has one of the longest axial path ways of any of the Khmer temples. It took me a long time to understand the significance of Lord Shiva. He saved the world by drinking the poison emitted from the mouth of the King of the serpents while the churning of the milky ocean was taking place. Once inside the main sanctuary a whole different ambience can be felt. It was here in this central chamber the devotees prepared for their journey through the gates of heaven and immortality would be the most sought after gift from the gods. Deep within the main sanctuary and behind the statue of the Buddha there is an entrance to the oldest part of the temple where the sacred lingam was anointed daily from the waters of the sacred spring. But before entering the most holy of holies there sits Shiva high above the doorway manifested as the ascetic praying with his Rudraksha beads. Rudraksha translated from the Sanskrit stands for the "eyes of Lord Shiva". The actual beads come from the Rudraksha tree (Elaeocarpus Ganitrus). As the legend goes the tree came forth from the tears of Lord Shiva's eyes. Twelve varieties of the tree symbolizing the sun came from his right eye, and sixteen varieties symbolizing the moon came from his left eye. The beads have been worn by devotees for thousands of years to maintain a spiritual path to enlightenment and liberation. On either side of Shiva are shown devotees offering prayers. The beads are also shown in Shiva's right hand on the Trimuti behind the main sanctuary. Indra happily rules over all the worlds and can be seen through out the temple complexes at Vat Phu. And in a special devotion to Vishnu the temple Thao Tao (lord of the tortoise) was constructed at the base of the Lingaparvata on the ancient road leading to Nandi Hall. Before arriving at Vat Phu the traveler would pay the deepest respects to Vishnu, who along with Shiva, helped save the world. Continuing on the ancient road after Thao Tao came the temple Nang Sida which only has elements of the shrine still standing but is still a testimony to the beauty and majesty of this temple. It's only a short distance from Nang Sida before you finally arrive at Nandi Hall. Perhaps the carving of the holy trinity (trimurti – having three forms) is the best example of a scene from the Vedic scriptures exemplifying the reign of the Hindu gods at Vat Phu. The scene sits quietly behind the main sanctuary and shows Brahma (creative force) sitting to the right of Shiva (destructive force) and Vishnu (preservation) sitting on Shiva's left. Shiva is also shown as half man and half woman (ardhanarisvara). Shiva's wife, Durga, is shown with her ten arms. Shiva and Durga portray the ultimate wedding of the destructive and creative powers of the universe which are the two greatest antagonistic forces to be balanced. The Trimurti sits quietly and unassuming behind the main sanctuary. Looking closely at the five faces of Shiva it is readily recognizable that there is a feminine quality to his expression. The five faces of Shiva are symbolic of his five manifestations: The Beneficent, The Destructive, The Vagrant Mendicant, The Lord of Dances, and the Great Lord (mahesamurti). Thus the trinity represents the embodiment of Shiva as Brahma the creator, Vishnu the maintainer, and Shiva as the destroyer. These three forces of the universe reside permanently in the Shiva linga representing Shiva the supreme lord of the universe. The long ear ornamentation is another affectation showing the combination of Shiva and his wife that has been integrated into Vat Phu. In fact every year during the full moon of February there is a ceremony (Shivaratri Festival) celebrating the wedding of these two forces where thousands of pilgrims come to worship and pay tribute to Lord Shiva. During the day the devotees chant "Om Namaha Shivaya" and at midnight the inner light of divine consciousness is obtained and a state of spiritual knowledge is acquired. Considering that this festival is still celebrated annually testifies to the high esteem and respect still paid to Lord Shiva at Vat Phu and a further testimony of the latent spiritual powers that still reside in this holy land. Shiva as half man and half woman. Vat Phu is the one temple that encapsulated the divine message which all the Khmer kings paid respect to through out the entire 1,500 year reign of the empire. Vat Phu was a temple to the stars and the knowledge of the stars was expanded even further with the construction of Angkor Wat which became the ultimate temple mirroring the secrets of the universe as well as the new capital of the Khmer empire. But the Kings still supported Vat Phu all through the duration of the empire. King Yasovarman I even took a stone from this holy city and used it as a corner stone for the construction of Preah Vihear. The holy land of Kuruksetra is still an active pilgrimage site and a site that can direct the mind into the ethereal realm of the gods.